Edward Cornwallis is honoured as the founder of Halifax. A British military leader who issued bounties on Mi’kmaw scalps, his statue in a city park named in his honour has been at the centre of division and debate. For years, the Mi’kmaq have fought to have his monument removed. It happened at the end of January — a celebratory moment for the Mi’kmaq. 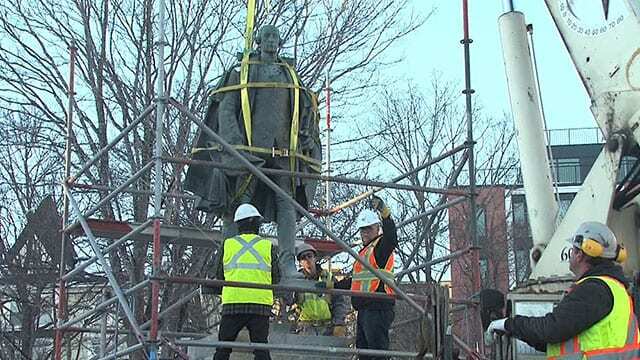 “We’re in a time now of truth and reconciliation, and peace and friendship,” said Mi’kmaw activist Rebecca Moore, watching crews work to lift the statue from its pedestal. Overhead, an eagle circled as a crane lifted the statue from its granite base. “For that eagle to come and fly right over us, just right the same moment as Cornwallis just got removed from his pedestal was just, it was very affirming to me,” said Moore. This was a moment three decades in the making and the focus of an APTN Investigatesepisode, History Decolonized. It started with Mi’kmaw Elder Dan Paul, who published “We Were Not the Savages” in 1993. Paul applied an Indigenous lens to the history of the Nova Scotia and it painted a vastly different picture. “In his correspondence with the Lords of Trade in London, [Cornwallis] made it clear that it would be best to root the Mi’kmaq out of the peninsula of Nova Scotia for all time and forever,” said Paul. “What kind of a man is that and why do we have a statue of him in the park?” asked Moore, just weeks before a sudden turn of events led to the statue’s removal. It’s a question Halifax city council has wrestled with for years. And a question that sparks fierce debate, one echoed across the continent. Last May, a speech by the Mayor of New Orleans on why the confederate monuments were being removed went viral. “There is a difference, you see, between remembrance of history and the reverence of it,” said Mitch Landrieu. In the United States, as monuments came down in 2017, racism ramped up. In Charlottesville, Va., white supremacists protested the removal of Robert E. Lee’s statue. Counter rallies were held and violent clashes followed. It turned deadly after a white nationalist drove his car into a crowd of protesters, killing a 32-year-old woman. Canada is hardly immune to the racist backlash when colonial history is questioned. Jones said it intensifies around the topic of Cornwallis. In council meetings over the past year, Halifax councillors have referenced the racist emails they’ve received on the topic of Cornwallis. Halifax mayor Mike Savage said it’s important the city grapple with an uncomfortable history. City council had struck a committee to explore issues around the commemoration of Cornwallis. Savage hoped it would be an avenue to education. But after months of no action, the Mi’kmaw chiefs lost patience and pulled out and demanded the statue be removed immediately. The grassroots moved quickly to plan a rally called “Removing Cornwallis.” City staff, fearing a potential conflict, recommended to council that the statue be taken down and put into storage. Within days, the debate was back before council who voted overwhelmingly in support of removing Cornwallis. “It’s down and it allows us to have that conversation we need to have on true reconciliation,” said Savage. 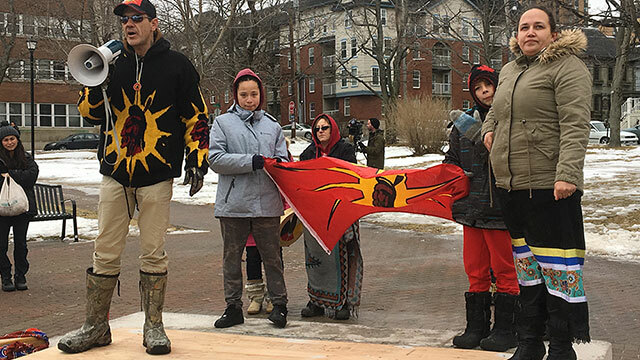 The Mi’kmaq held a rally at Cornwallis Park, standing where the statue had stood just days before. Mi’kmaw Warrior Toby Condo speaking at a gathering after the statue came down. What followed was drumming, smudging and a thank you to Dan Paul, for his tireless efforts to expose the Mi’kmaw narrative of a city built in the traditional, unceded territory of Mi’kma’ki.